Monday UPDATE: Bella, Abe and Bond were a smashing triple threat over the 5-day Thanksgiving weekend as box office receipts hit a record-setting $290M. But that's not the mind-blowing part of the whole thing, Rise of the Guardians opened with a thud, a measly $32.5M since its Wednesday opening. In the world of 3D CGI that's Heaven's Gate-esque – Wreck-It Ralph banked that sum in two days not five. We've arrived at one of Hollywood's most anticipated weekends of the year. Thanksgiving's essentially a 5-day weekend, with Wednesday taking on the role of a Friday night – coffers are guaranteed to be stuffed with cash. While there's no legit tentpole entering the marketplace, the leftovers aren't exactly down-the-disposal material. Next week though, we crank things down until The Hobbit: An Unexpected Journey hits at Christmas. 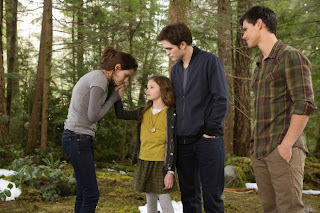 On a side note, this will be the last Twilight picture ever posted on this blog. There is a God. The Twilight Saga: Breaking Dawn Part 2 $65M - Twilight films are freakishly front-loaded. Find me a Twihard who's waited until things die down before hitting the multiplex – just one. As a result, get set for precipitous plunge in its second stanza. Rise of the Guardians $48M - Excitement for a CGI Santa versus some random evildoer seems to be lacking but with kids out of school and families in desperate need of a time-sucker, DreamWorks should score reasonably well with this. The hope is for a long holiday season run, similar to what Hotel Transylvania did at Halloween. Skyfall $45M - Days after topping Quantum of Solace to become the biggest Bond ever at the box office, Skyfall is set to surpass $200M in domestic receipts. Lincoln $28M - Thanksgiving plus the 16th president? Irresistible. Life of Pi $27M - Though Fox is trying to market Ang Lee's visual masterpiece as the next Avatar, nothing could be further from the truth. Folks expecting a flood of action will doze off in the middle of the montage of zoo animals that opens the film. That said, there's decent buzz and plenty of Oscar talk to buoy business.